Bronze statuette of a pharaoh, Thonis-Heracleion, Aboukir Bay, Egypt, 30th–26th dynasty, height 8-1/16 inches (SCA 1305). IEASM Excavations. ST LOUIS, MO. – While historians expect shipwrecks to be found on the ocean floor, the subsidence of entire cities beneath the waves has the mythic ring of lost Atlantis. 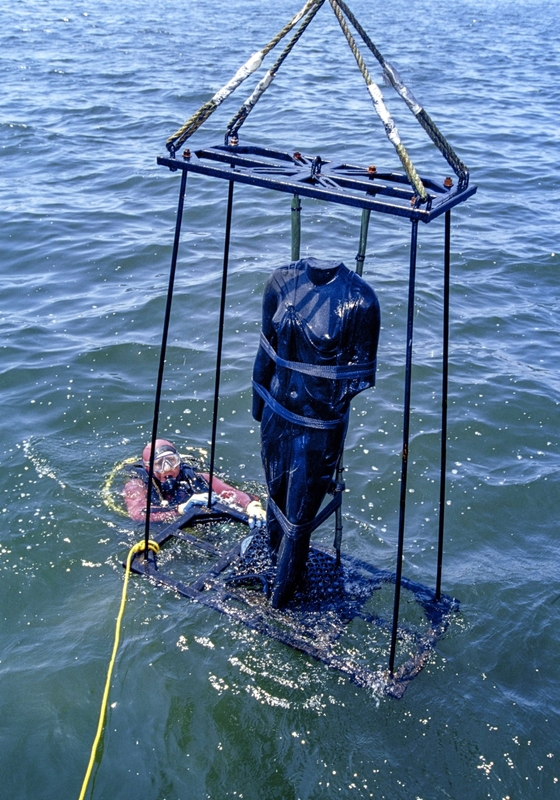 Impelled by a visionary conviction that important marine sites remained uncharted, Franck Goddio in the mid-1980s founded the European Institute for Underwater Archaeology, in its French form known as the Institut Europeen d’Archeologie Sous-Marine (IEASM). 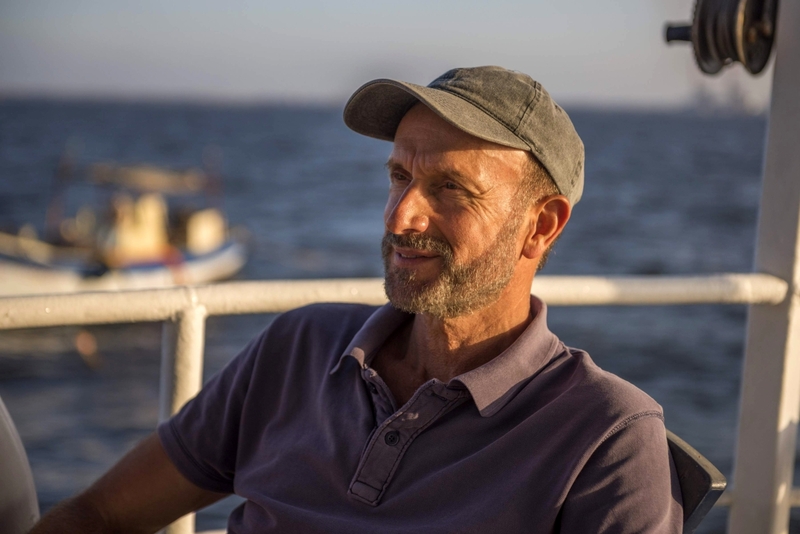 Over the last 20 years, he has made astounding discoveries beneath the bay by the city of Alexandria in the Egyptian Delta. His finds are displayed in the United States for the first time this summer. 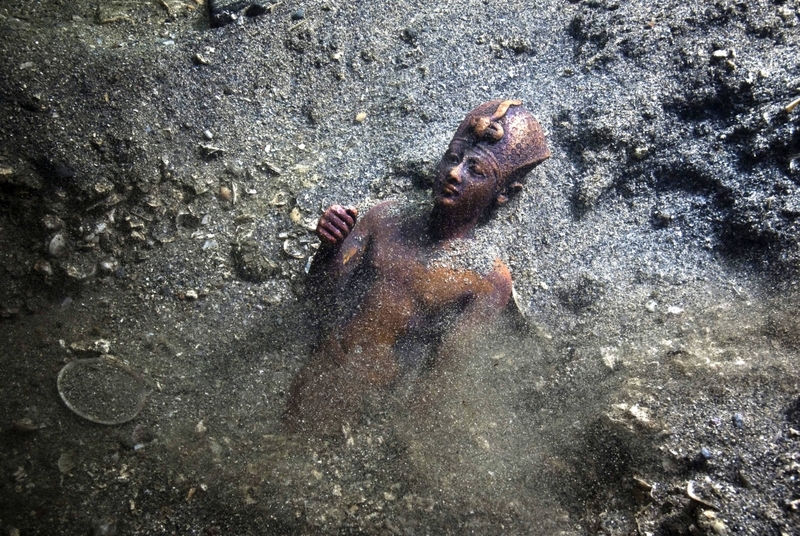 “Sunken Cities: Egypt’s Lost Worlds” remains on view at the Saint Louis Art Museum (SLAM) through September 9. International travelers might have caught previous presentations of the material at the British Museum in 2016 or at the Institut du Monde Arabe in Paris in 2015. The transportation and installation of the archaeologists’ finds was an enormous undertaking on the part of SLAM. One colossal statue – almost 18 feet high – weighs 9,700 pounds. In addition to more than 250 works from the underwater excavation, visitors will see exhibits from the Cairo and Alexandria Museums that help complete the story. 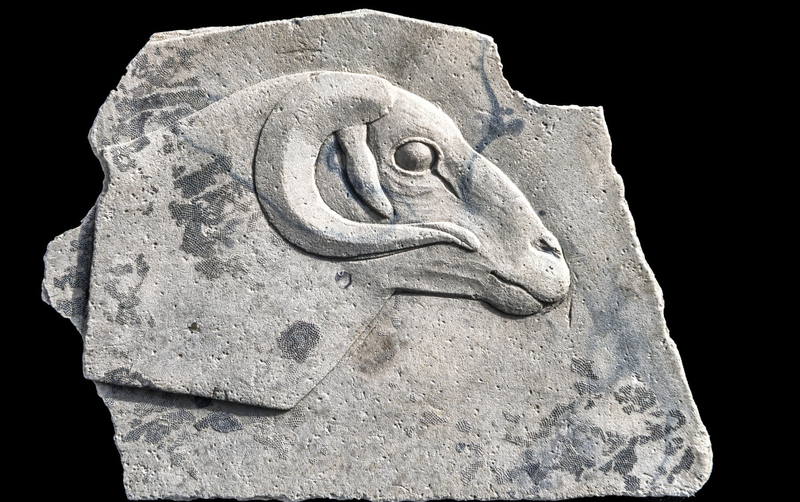 Many have never ventured outside their country of origin, making this the most important Egyptian exhibition to visit the United Sates in the current century. The show is installed in the galleries of the museum’s East Building. The luminous expansion space designed by David Chipperfield opened in 2013. Most people know of the Pyramids and the Sphinx, the great monuments of Ramses II, the Tomb of Tutankhamon. Travelers to Egypt see them all. Ancient Egyptian civilization, however, spanned over 3,000 years and through many ups and downs. Imagine if George Washington had been born in 1000 BCE and our Republic was still chugging along. 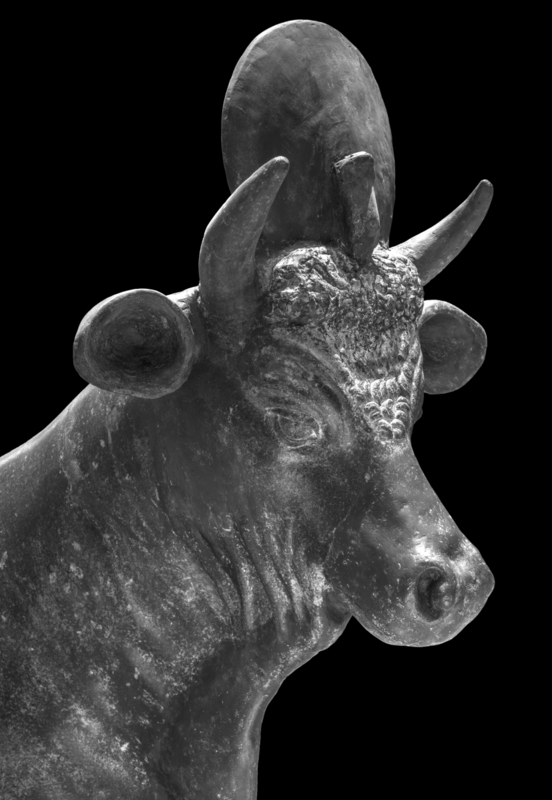 The underwater discoveries made by Goddio’s team in the cities of Canopus and Thonis came late in the last centuries of that long history. That was Cleopatra’s end of the story, and we all know what happened to her. Egypt became a province of Rome in 30 BCE. The artifacts come from a different place, as well as a different time. Bypassing all that sand in Upper Egypt, these excavations took place off the fertile delta in Lower Egypt, north on the map and where the Nile flows into the Mediterranean. Our well-known Cleopatra, the seventh queen of that name, closes out the Ptolemaic Period, a Greco-Egyptian era whose beginning coincided with the death of Alexander the Great in 323 BCE. He was buried in Alexandria, his namesake city, near the body of water under which the discoveries took place. At that time, the Mediterranean world enjoyed a lively trade of goods, ideas and cultural influences among countries surrounding the sea. The ports of Lower Egypt became prosperous and increasingly diverse. 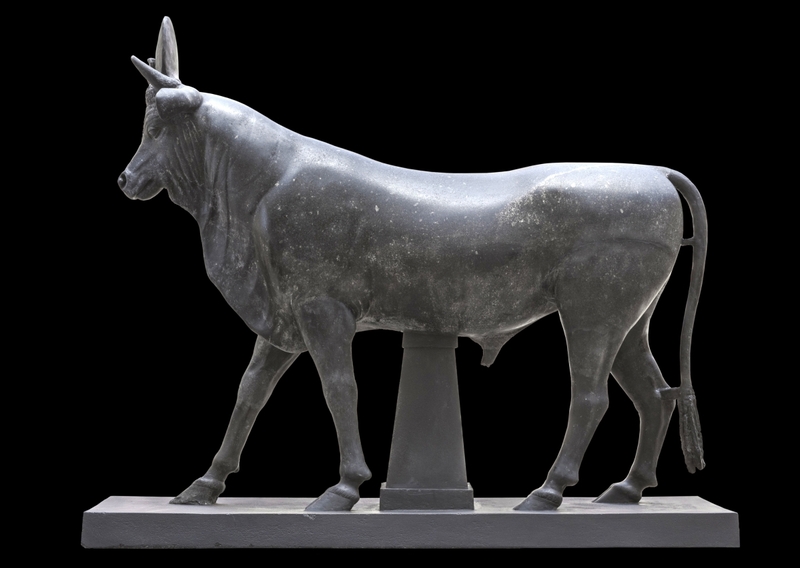 One effect, demonstrated especially by the sculpture, is a cross-pollination of artistic styles between Greece and Egypt. The religious personas of Greek and Egyptian gods merged, as well. Franck Goddio is the charismatic driving force and director of these Egyptian marine excavations. He was on hand in St Louis to supervise the installation of the objects and lecture at the show’s opening. After a more conventional career as an economic advisor to the United Nations and the French Ministry of Foreign Affairs, Goddio decided to pursue his real passion by founding IEASM. After some classic shipwreck investigations, he focused his attention on the mapping of the bay off the site of the ancient port of Alexandria in 1992. Putting together a team of archaeologists, historians, geologists, geophysicists, computer engineers and expert divers, he worked closely with the country’s Ministry of Antiquities. 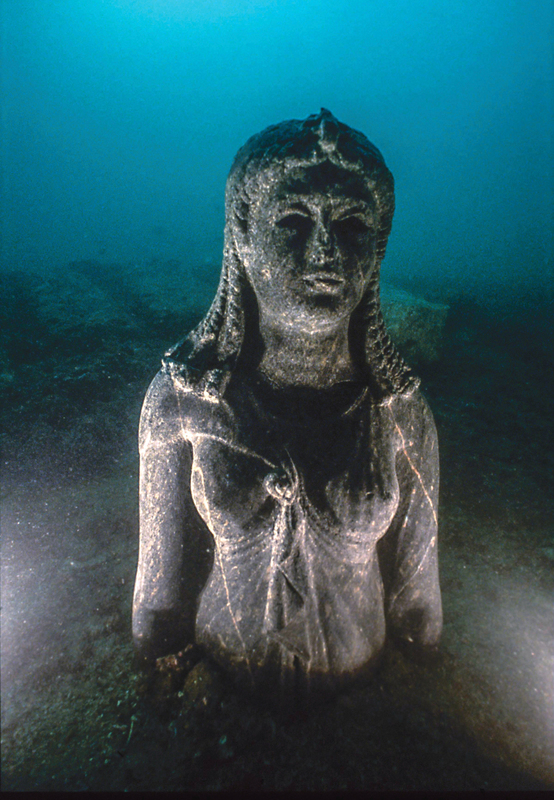 In 2000, they discovered the submerged ancient city of Thonis (Heracleion) and parts of the nearby city of Canopus. A gradual rise in the sea level left these areas submerged by about the Eighth Century CE. 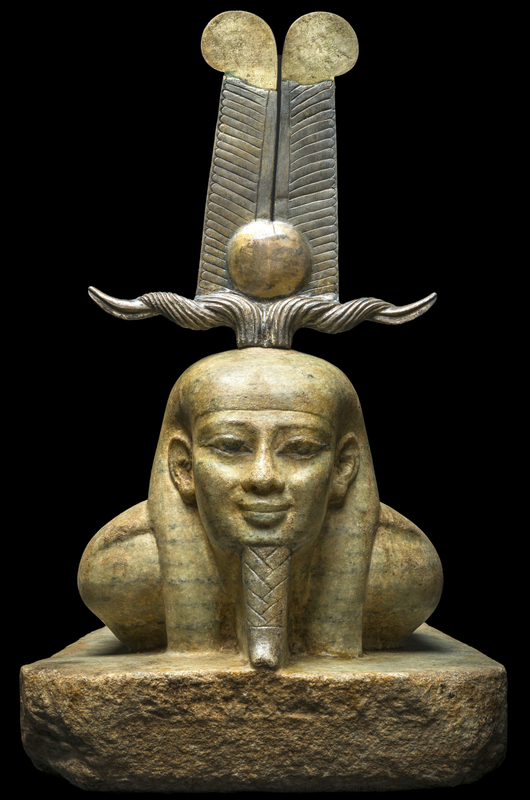 Most recently, Goddio’s research has focused the religious ceremonies and mysteries connected to the worship of the god Osiris, a principal deity throughout the millennia of Egyptian civilization. 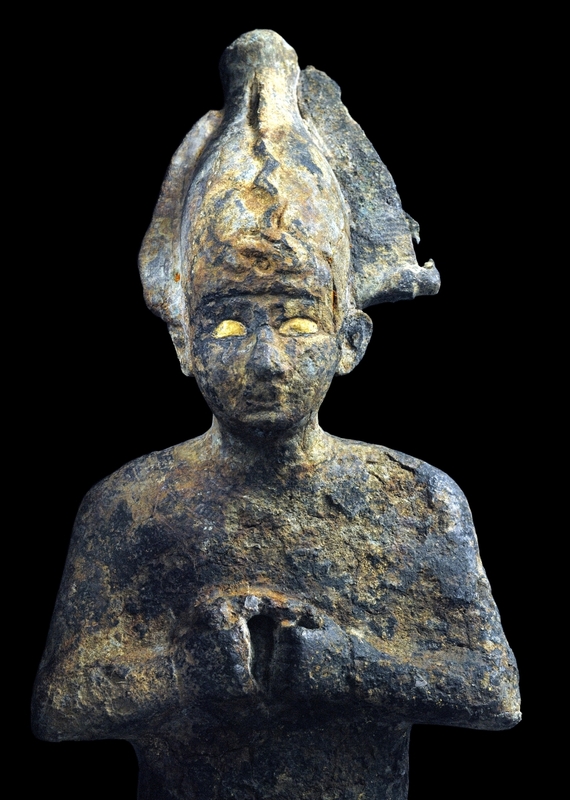 Osiris was associated with the afterlife and the resurrection of the dead, but also played an important role in the regeneration of the fertility of the land itself. The exhibition catalog, Osiris: Egypt’s Sunken Mysteries, chronicles the story of the submarine finds, one of which was a sacred waterway linking the two cities. The volume illustrates many of the ritual objects uncovered on the floor of the bay. 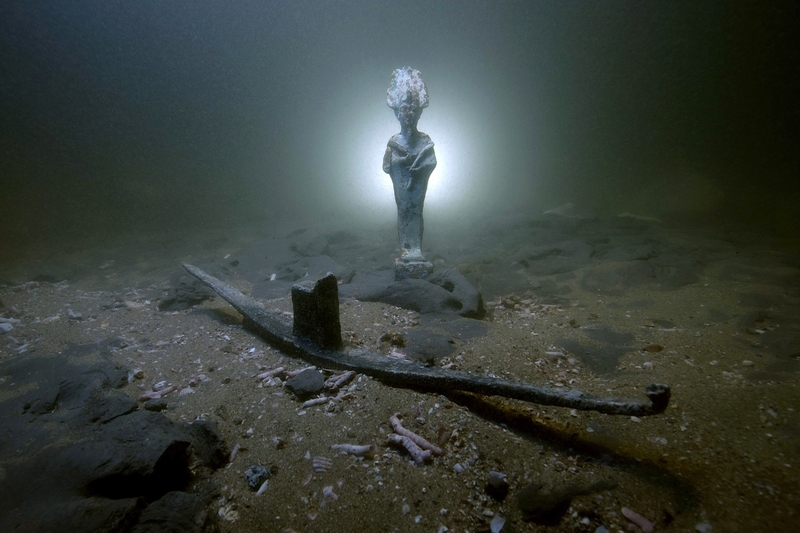 A statuette of Osiris and a model of a processional barge for this god, Heracleion, Egypt. Maritime Museum, Alexandria. IEASM Excavations. Long ago, the Scottish folk singer Donovan sang of Atlantis, “Way down below the ocean, where I want to be, she may be.” As we watch dramatic images of ancient queens rising through the waters, Franck Goddio has certainly fulfilled his quest to find the art and artifacts that reveal new information about the inhabitants of a now submerged world. To read more about the history and results of the excavations, see Osiris: Egypt’s Sunken Mysteries by Franck Goddio and David Fabre (Flammarion, 2017) and Diving to the Pharaohs: Franck Goddio’s Discoveries in Egypt by Jurgen Bischoff and Christoph Gerigk (Steidl, 2016). Hilti Foundation in Lichtenstein funded the excavations. 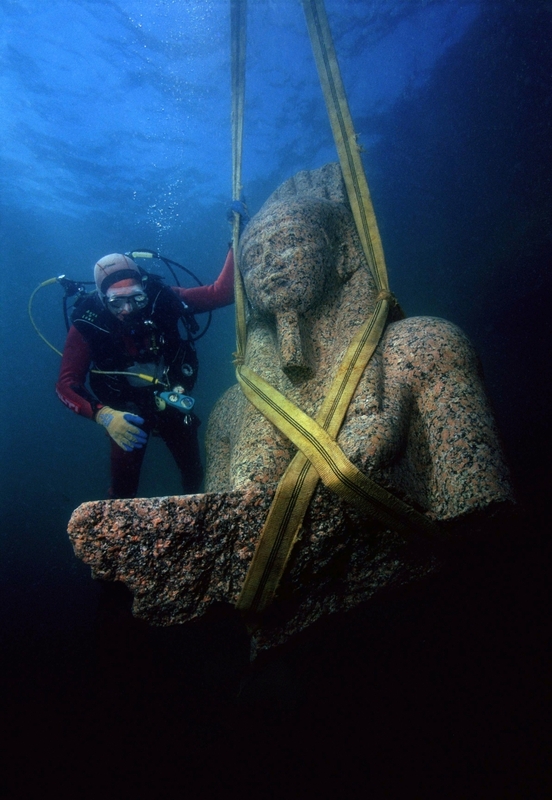 For more, see www.hiltifoundation.org/en/Fascination-underwater-archaeology. Goddio and the IEASM team work closely with the Oxford Centre for Marine Archaeology. To read more about their mission and publications, go to www.arch.ox.ac.uk/ocma.html. The Saint Louis Art Museum is at 1 Fine Arts Drive. For information, 314-721-0072 or www.slam.org. 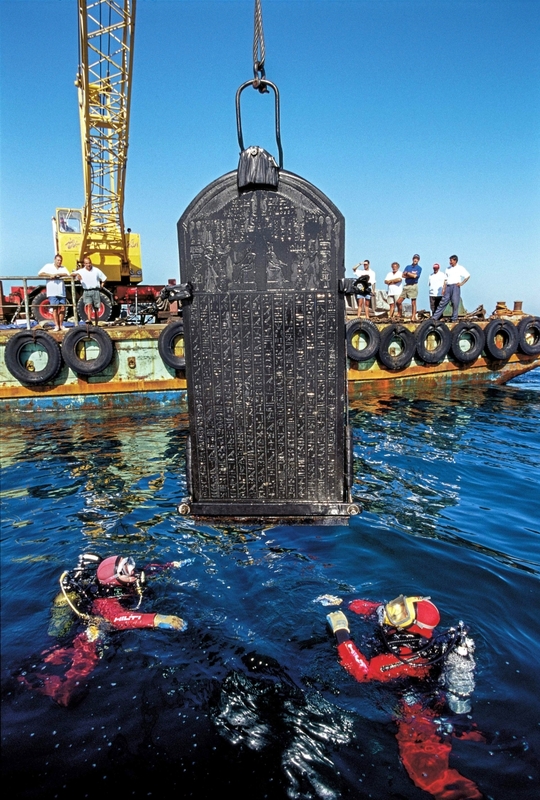 The stele of Thonis-Heracleion being raised out of the waters of the Bay Aboukir, Egypt. National Museum, Alexandria, (SCA 277). IEASM Excavations.